After meeting all the characters in level 1, we are now on the next Level and we will be entering Ralph's home domain, the Fix-it Felix Jr. Game. Let us enter the city of Niceland and meet the faces behind this wrecking stage. The All-Around Good Guy. 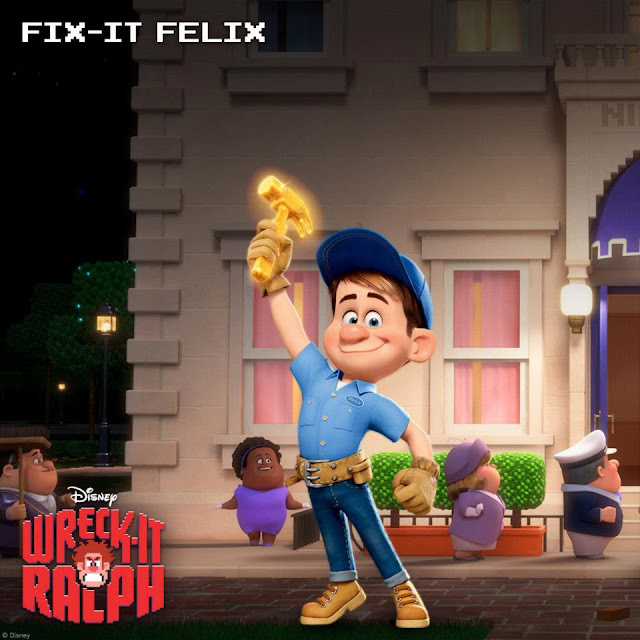 Felix is the popular star of Fix-It Felix Jr. and Niceland's hammer-wielding maintenance man who's beloved by all. When he is not busy fixin' all of Ralph's wreckin', this gold-medal-winning good guy is being showered with kisses, praise and pies from his tenants. Pint-Sized Party Planner. 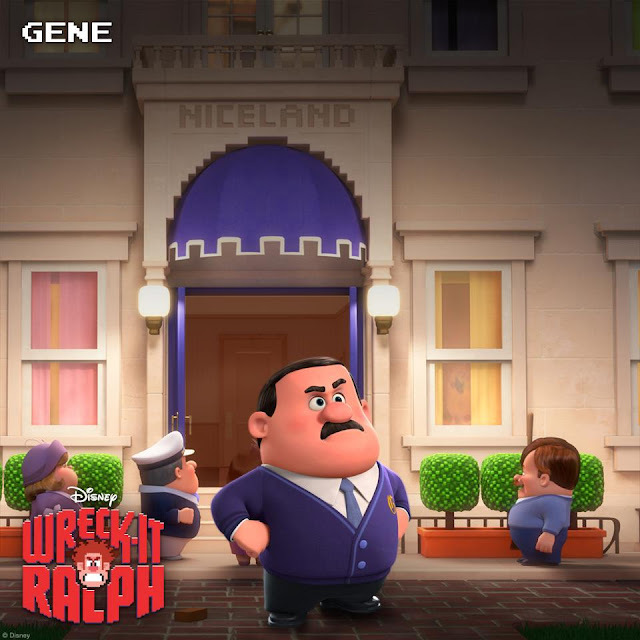 Gene is the blocky, pint-sized leader of the Nicelanders, the window-filling victims of Ralph's destruction in the game “Fix-It Felix Jr.” Like his fellow apartment residents in peril, Gene worships Felix and despises Ralph. In his spare time, Gene plans cocktail parties, but is always sure to leave Ralph off the guest list: To Gene, Ralph's just a bad guy and that's all he'll ever be. Apartment-Dwelling Residents in Peril. When they aren't playing the victims in “Fix-It Felix Jr.,” the Nicelanders live to worship Felix and criticize Ralph. Responsible for baking power-boosting pies to aid the good guy's in-game mission, the fawning fans of Felix spend their free time planning cocktail parties, but they are always sure to leave Ralph off the guest list. These blocky, pint-size window dwellers, including Gene, Roy and Mary, can't seem to get past Ralph's title, and the wreck-less behavior that goes with it. Nothing short of a heroic miracle could convince them to include Ralph in their lives. Opening across the Philippines in Nov. 01 in Disney Digital 3D and regular theaters, “Wreck-It Ralph” is distributed by Walt Disney Studios Motion Pictures International through Columbia Pictures.